With ties between China and Russia growing, the Chinese government is looking to take them to an entirely new level - religion. A senior religious affairs official told the Global Times that China will officially recognize a Chinese priest ordained by the Russian Orthodox Church for the first time later this year. He will be the first Chinese priest ordained by Russian Orthodox Church to be given official standing in China in the last 60 years. Yu Shi, a former banker and devout Orthodox Christian in China, was sent to study Orthodox theology in Russia in 2012. Later this year, he is expected to be the first Chinese priest ordained by Russian Orthodox Church to be recognized by the Chinese government. He will serve in Harbin, Helongjiang Province in the Holy Protection Church. He is currently assisting ceremonial services there, but is not yet able to fulfill all the duties of a priest. Russian Orthodox Christianity is not one of China's five officially recognized major religions. Yu Shi's ordination has been interpreted by experts as a major shift in China's attitude towards Orthodox Christianity. This official recognition will allow Yu Shi to lead prayers, preside over Masses and funerals, conduct baptisms and hear confessions. "Yu Shi has completed the theological courses. There is some remaining missionary training he needs to complete. Because China doesn't have ordination for the Russian Orthodox Church, he is expected be ordained by the Russian Church," Hao Runnan, division head on issues relating to Orthodox Christianity at the State Administration for Religious Affairs told the Global Times. The official also confirmed that China is expected to send one or two more theology students to study in Russia soon with the goal of their eventual ordination. According to Roman Catholic news website Asia News, there are 13 Chinese students at the Orthodox Sretenskaya Theological Academy in Moscow and the Academy of St Petersburg. At the end of 2014, Kung Ming Cheung was ordained as a priest in Russia serving Saints Peter and Paul Parish in Hong Kong. The religious affairs official told the Global Times that students who go and study in Russia by themselves are not recognized by the government. The recent emphasis on Orthodox Christianity by China is no coincidence. Chinese President Xi Jinping has met Patriarch Kirill of Moscow and All Russia twice over the last three years. Xi said he hopes the Russian Orthodox Church and Patriarch Kirill will play a bigger role in the future in cementing relations between the two countries. The remarks will encourage the small Orthodox congregation in China. The officially atheist country used to ban religion altogether during the Cultural Revolution (1966-76) but has now become more open. Still, the expansion of religion, especially evangelical Christian groups, has concerned the government. In some cases, conflicts have occurred when the government has tried to regulate underground churches. Russian Orthodox Christianity has existed in China since 1685. Between then and 1924, Russia sent 18 Orthodox missions to China. In 1955, the Orthodox Church in China separated from the Russian Church. Last month, Reverend Wang Quansheng, the last Chinese Orthodox priest died at the age of 90 in Shanghai. According to a Russian Orthodox Church report there are 15,000 Orthodox Christians in China today. But Chinese scholars believe there are probably only a few thousand. Petro Krachoycov, 47, from the Xinjiang Uyghur Autonomous Region, is one of the thousands of believers. He was once a nomad, but currently serves as the administrator of the Russian Orthodox Church in Xinjiang's Yining city. Tall, with light skin and brown hair and eyes, Petro speaks fluent Russian, but his Chinese is broken. But he has lived in China all his life and was born and raised in Xinjiang. His forefathers came to Xinjiang from Russia during the early 20th century. On June 27, CASS held a conference on Russian Orthodox Christianity, inviting senior officials, top scholars and the four lay administrators of Russian Orthodox churches in China to have a candid, open and wide-ranging dialogue. Petro and his wife Tonia, were nervous about simply attending the conference, let alone speaking in front of 40 senior Chinese religious officials and experts. He and his wife spoke in front of the officials and scholars on the history of the church in Yining. They told the gathered bigwigs that the original Yining Orthodox church was destroyed during the Cultural Revolution and that for a long time, hundreds of local ethnic Russians prayed and read the Bible at home. In 2002, the Yining government rebuilt Yining church. It became a place of worship for the around 1,000 ethnic Russians in the city. Only around 20 worshippers attend weekly but during major festivals, hundreds of worshippers come to spend Christmas and Easter together. A 78-year-old Russian woman presides over the services now in Yining. However, given the strict rules of the Orthodox church, she can only lead the congregation in reading the bible and chanting hymns. Many duties simply cannot be carried out by a woman, or anyone that has not been ordained. "What we need is someone who knows how to lead us in prayer, to hold Mass, conduct baptisms, hear confessions and hold funeral rites," said Petro. Petro recalls that over the last four decades he read his old yellowing Russian Bible on his own every day. Praying that one day he could become a priest and serve Yining's congregation. The major problem facing Orthodox Christianity in China is a lack of clergymen. Without a bishop, there is no way for the Orthodox Church in China to ordain any new priests by itself. China has four churches in Xinjiang, Inner Mongolia and Heilongjiang that are officially recognized as Orthodox churches. They all face a similar situation to Yining. At the conference the atmosphere is extremely open and positive, with everyone looking to improve the standing of Orthodox Christianity in China. However, the task is daunting. Catholicism and Protestantism have already been systematically studied in China. There is no research center that focuses on Orthodox Christianity in China. "We need to study Orthodox Christianity and its historical impact. Russian culture is deeply linked with its religious traditions. We need to understand its music, literature, philosophy in addition to the ups and downs of the Russian church, and the relations between church and the State by paying more attention to the legislation on religious affairs in Russia," said Zhuo Xinping, director of Institute of World Religions at CASS, said during the meeting's opening remarks. New churches are being built or restored around the nation. In Tacheng, Xinjiang, a new 1,000-square-meter Orthodox Church will be built by the local government. In Wuhan, Central China's Hubei Province, a magnificent old Orthodox Church will soon be restored. In Harbin, some famous Orthodox churches have already been restored and are being used as museums. Apart form churches, many areas have also set up China-Russia cultural exchange institutions. Within the protective walls of the Russian Embassy lies the Orthodox Church of the Dormition of Most Holy Theotokos. Its modest but majestic onion-shaped dome and Greek cross rises from the building's roof. The church was built in 1901. Every Sunday, dozens of the faithful participate in the liturgy. The church became a garage during the Cultural Revolution but was turned back into a church in 2009. Orthodox icons and religious paintings hang on the walls of the church, with the light reflecting off their golden outlines creating a soft glow. On the second floor, paintings and photos reconstruct Russian Orthodox missionary history. A copy of a Russian-Chinese dictionary, missionary documents, and relics from demolished Orthodox churches are preserved in the museum. 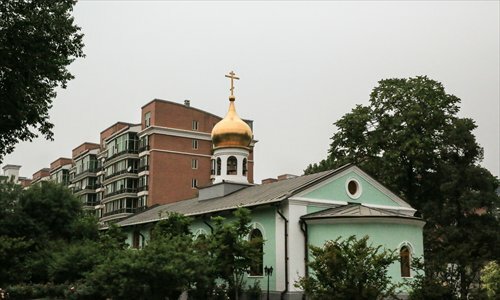 Though history is on display everywhere in the embassy's church and museum, the current status of the Russian Orthodox Church in China is a sensitive subject for both Russian diplomats and Chinese experts. At the conference at CASS, some scholars said their academic papers on Russian Orthodox Christianity have been frequently rejected by Chinese academic journal editors who say that the subjects is too "sensitive." History shows that the Orthodox Church has often been entwined with secular power. The relationship between the Orthodox Church and the Russian state has traditionally been close. "The problem of the Orthodox church is not purely religious. If it was just a religion, the issues surrounding Orthodox churches in China would have been solved a long time ago. But with the Russian Patriarch constantly pushing for the growth of the Church in China and the fact that China and Russia are neighbors, this makes it a bilateral issue. It makes this religious issue more complicated," said one anonymous scholar. As a ardent disciple and supporter of the Orthodox Church, Russian President Vladimir Putin fully recognizes the spiritual impact of the Church. The Orthodox Church owns many TV channels in Russia and is active in the media, publishing and education sectors. "The Church has become linked to Russian diplomacy. With the active involvement of Orthodox Church in diplomacy, the Church is expanding its influences on overseas churches. It will inevitably have an impact on Orthodox churches in China," writes Tang Xiaofeng, assistant professor of Christian studies at CASS, in his book Field Study of Chinese Christianity. Some Chinese scholars also point out that as the most important religious institution in Russia, the Russian Orthodox Church has also played a significant role in history as a moral authority to balance executive power in Russia. Many churches in Xinjiang, Heilongjiang and Inner Mongolia have frequent contact with Russian missionaries through book donations and church services. "We need to study the Russian Orthodox Church with very objective mind. Because Orthodox Christianity in China still lacks staff and influence, these absences cause increasing connections between Chinese and Russian churches. With an objective mind, we can better understand the needs of Chinese Orthodox churches," Tang Xiaofeng said.